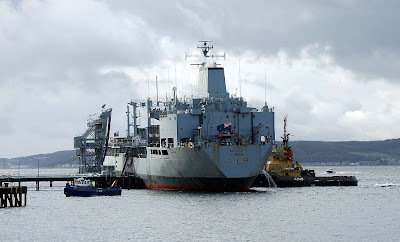 The Royal Fleet Auxiliary tanker BAYLEAF arrived at Loch Striven jetty this morning, and is seen here being berthed by two of Serco Denhom's Clyde based tugs, SD IMPETUS and SD NIMBLE (at the tanker's bow). The local workboat FRAOCH, which is the Gaelic word for 'heather', was performing her usual line-running duties. Above the aft deck of SD IMPETUS, theMoD Pilot Cutter SD MONEYPENNY can be seen arriving to convey the pilot back to Faslane. BAYLEAF's visit is likely to be in connection with a forthcoming NATO exercise due to start in a week's time.